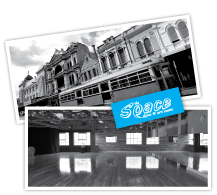 The Space Dance and Arts Centre is an exciting dance and arts centre featuring a variety dance and rehearsal studios, theatre, meeting room, gallery space and lounge. The Space has a range of dance classes for people of various dance abilities and interest levels as well as providing rehearsal and performance space for artists and producers. The Space Dance and Arts Centre is located on Chapel Street opposite Pran Central. (Entrance in Carlton St). Conveniently close to coffee shops, restaurants, parking, Chapel off Chapel and in the heart of Melbourne's shopping district.